Jess Mehr, photographed here with former fiction editor Tadd Adcox at the 2007 AWP Conference, grew up in Union, NJ, where she was taught that New York City is the greatest place on the planet, Florida is pronounced “Flarida,” and one should never pump gas, change a tire, repair brakes, move, cut down a tree, landscape, refinish or build anything without professional assistance. Since graduating from the University of Virginia in 2001, she has worked in London and Dublin, backpacked through 14 countries, and spent 3 glorious years bartending at the Outback Steakhouse. 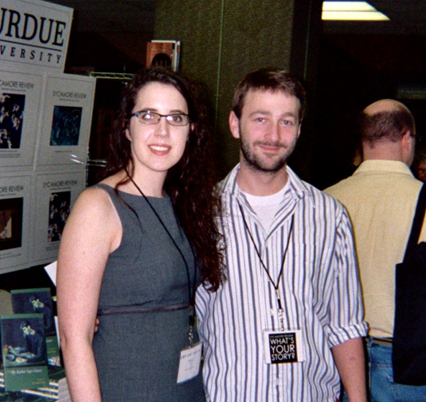 She is currently a third-year in Purdue’s MFA Program and has set up house in Lafayette with her boyfriend Stephen. Jess just started her first novel, What You Can Live With, which, after several point of view changes and nervous breakdowns, is finally off the ground. As far as creative influences, she plans to marry Lorrie Moore or Tom Perrotta, and the best books she read this summer were The Road by Cormac McCarthy, Falling Man by Don DeLillo, and The Bright Forever by Lee Martin. She is addicted to Dunkin Donuts Iced Coffee, White Russians, Lucky Charms, text messaging, striped tights, gummy bears, Heroes, Law & Order, Simpsons, and, much more shamefully, Columbo and Matlock. She is terrified of ventriloquist dummies and clowns, and strangely, has never been camping, skiing, hunting, fishing, or swimming in a lake. Non-Fiction submissions have increased dramatically in the past two years, and Jess hopes that trend will continue.